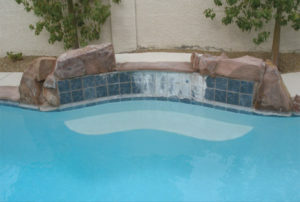 The Las Vegas and Henderson area has a very high calcium hardness level within its water. Water is considered “hard” when it contains a high level of dissolved minerals. The hardness of Las Vegas Valley Water District water is 283 parts per million or 16.5 grains per gallon, categorized as “very hard.” If you’re on a water well the levels are likely the same. A problem with the hard water appears in swimming pools with scaling on the tiles and rocks around the pool. A water conditioning unit would be a good addition to your pool equipment to help prevent scaling. 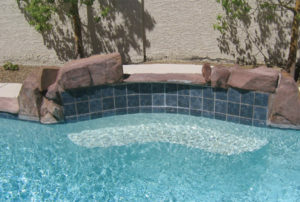 Aqua-Rex offers a unit that has a 100-day money back guarantee. It reduces phosphates and total dissolved solids within the water this helps to keep heater pipes clear and saltwater cells clear too and minimizes scale build-up on pool tiles. 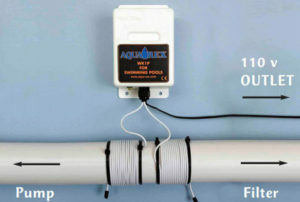 If you’re interested in getting more information on Aqua-Rex installed on your pool please contact PoolStar. This entry was tagged Hard water, las vegas tile cleaning, Henderson tile cleaning, Swimming pool tile cleaning. Bookmark the permalink. ← Pentair iChlor salt system.